The plan was to leave real early on Saturday morning. I had been prepping camping gear, tying some of Mike’s famous soft hackle flies and anticipating having better results than my previous trip. My impression of this river is as was the first time I laid on my eyes upon her, “Wow! there are salmon here!” Anyone who has visited her probably is amazed when a salmon jumps out of the water here. The river does have its deep sections but it does not seem like big enough water to hold such huge fish. We did end up leaving sometime Saturday morning, once the SUV was packed to the gills and beyond. I had reserved a campsite at a private RV park along the Trinity River just a stones throw away from the town of Lewiston. When I reserved it I specified one of the sites along the river. There wasn’t much shade with the campsite along the river but we were right on the river and because my campsite was on the Trinity River I had miles of private water to fish. Many times I would wake up early, get the coffee and campfire going, put my waders on and I was fishing. What more could you ask for. The bathrooms were clean and not too far from the campsite and they were not the usual pit toilets they were real porcelain. They also had showers, sold fire wood and had a group site with a large BBQ pit if needed. We arrived, setup camp and after a quick lunch we were off to the fly only section of the Trinity River. As we pulled in I could see some of the members vehicles parked at the staging area. Dave Peterson was getting ready to go out again. After a friendly chat with Dave the girls and I got ready and were soon on the river wading. The river had changed from my last trip but most of the holes were still there. We saw some otters and geese on the river and hawks fling above. Wildlife is abundant on this river. The time seems to slip away when you’re fishing a river and by the time I at my watch it was too late for the club dinner. So, we went into town to see if we could spot any of the club member’s cars but I think we were too late. We had dinner at a diner just off the road through Lewiston across from the gas station. After dinner I fished the river in front of our camp. Right before sunset the swallows would swoop down to feed on the evening hatch. I was out there fishing the private waters, mostly caddis flies were hatching. There were also several nice holes on this stretch of river and I actually caught one of my largest rainbows here. 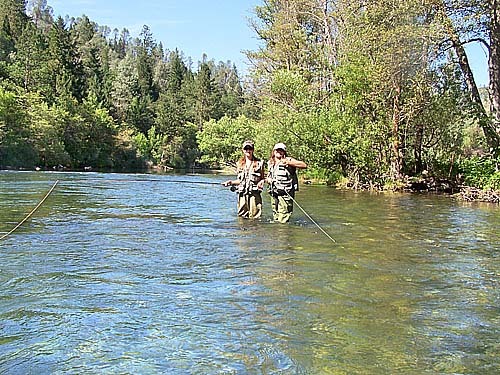 I would fish one section and the girls would play on the river in their swimsuits on another. When I caught a fish I could call over to them and show them my catch. What more could you ask for? I also saw a nice salmon roll one evening. The next morning I fished the private waters early on and did well. I was able to fish the morning hatch and again the swallows were out diving in and out along the river grabbing caddis flies. Earlier in the morning I stated the ritual morning camp fire, whoosh as the fuel lit the logs up! My wife and I would have our morning coffee in front of the fire. One morning we saw a bald eagle flying along the river. What an impressive majestic site. Later after breakfast we hit the upper stretch of the Trinity River under the Lewiston Dam. There are many holes along the way and the fish were abundant. My daughters caught many trout and smolts. 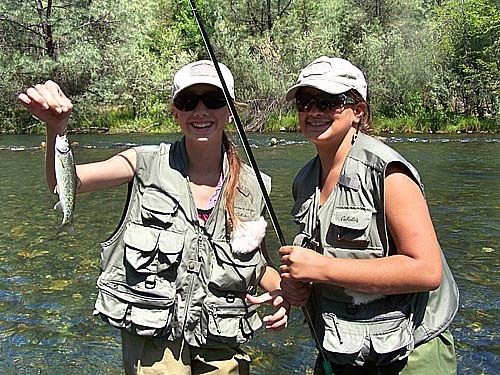 My daughters Elizabeth and Julia were extremely happy about the numbers of fish they caught. I caught a nice rainbow in the 16-17” range which made my day. Later in the day in a lower section I saw a nice steelhead jump. It was a dull greenish brown in color with a read stripe along side. Someone later told me it was probably a salmon. Who knows but it impressed both the girls and I that a fish around 25 lbs jumped out of the water right in front of us, Wow! What a surprise. We fished late this day got back to camp at a later time and I was still able to fish the camp waters in the evening after a dinner of BBQ sausages and corn. The next day we started to have battery problems. We still fished the fly only section and probably had one of the best days on the river of the trip. The girls spotted a deer in the woods just off the river. Trout were jumping and the girls were catching fish like pros now. After lunch and when it was time to go back to camp we had a dead battery. Unfortunately there was no one around and it is by all means a very desolate place. I hiked up to the road and managed to find a couple of beer drinking locals sitting in their truck. An older 60’s era blue GMC. They said “Jump in the back, we’ll help you out”. They were very help full but we could not jump the SUV for some reason; the battery was too far gone. So I jumped in the back again and they gave me a ride into Lewiston, I didn’t realize this but driving did not stop their thirst for Bud as I jumped out of the truck at the repair shop, the driver was finishing his beer. I can’t remember the last time I sat in the back of the pick up down the highway at 50MPH+. I ended up buying a battery, getting a ride back and installing it. Finally we were off again and on our way back to camp. I was able to fish that evening at camp after dinner. The next day I was able to fish the early morning at camp. It was nice, but the fish were not as active as the previous evening. I made the final breakfast packed up camp and we were off again. All in all it was a great trip. We had many fish days and the girls and I learned a lot about fishing and nature. I learned a better more consistent method of fishing my soft hackles. The girls learned how to wade this type of river and where the fish hang out. 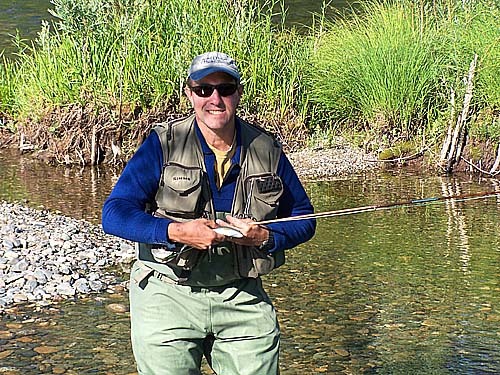 If you noticed, this trip I was using my Heddon #14 Bamboo Fly Rod. It is an antique from the 30’s but when I bought it last year I promised my self I would fish it and not just store it away. This river is just the right river for a bamboo rod and it worked out well. 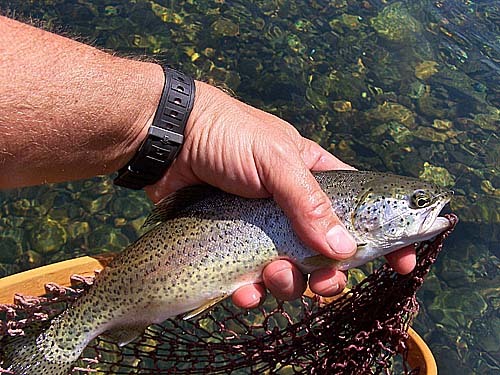 It is a very sensitive rod and is exhilarating to play these medium trout with a rod that sensitive. You actually feel the nymph traveling along and any slight bump is transferred to your hands. Playing a fish on this rod lets you feel the vibrations of the fish as it does battle. So, I will fish the cane rod and fix the cane rod as needed. When it’s too small to fish or the action is diminished I will burn it and scatter the ashes on the last river I fished it on. I think that is the proper way to honor a cane rod. How about you?